Automotive Indicators are manufactured in compliance with the international regulatory standards. 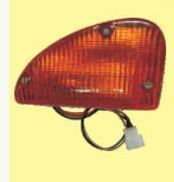 These automotive indicators ensure utmost safety and are made using best quality raw material. The TRC is an easy to use device to check the rotating direction of Teikoku Canned Motor Pumps whose rotating units are all fully enclosed thus invisible from outside. This pocket sized, portable instrument can also be used to check the direction of rotation of regular induction motors. The system is designed and integrated for the purpose of Analysis, Monitoring, Recording and Multi-channel Direction Finding of Target Hopping HF Radio Links operating in Frequency range of 0-32 MHz. The System provides the Intelligence community with an interactive De-hopping scenario capable of Hopping Signal Acquisition and Offline De-hopping and reconstruction of transmitted information. SP-055DP is applied with fuzzy scanning technology to detect peeping cameras, tapping, cellular phones and other radio frequency devices. This detector surely avoids being peeping or tapping to protect privacy or information being disclosed secretly. SP-055DP has installed with unique Analog / Digital selection switch. We are engaged in offering to our customer a wide rage of Indicator. We are providing a wide range of Indicators to our valuable customers. The automotive indicator lights we offer have high brightness, good liability and beautiful shape. The indicators that we supply to our clients are highly praised. These Indicators are provided by us at very reasonable price. We are engaged in offering high quality Indicator to our customer.